The AHL callups, on the whole, played arguably their best game of the season. The AHL caliber goaltender, however, did not. Jeff Zakoff unexpectedly got the start shortly before the start of the game as Marc-Andre Fleury was regulated to being the backup due to illness. The decision to allow Zatkoff the opportunity to play for a team where every point is critical remains baffling, and he struggled fighting through traffic in this one as the Tampa Bay Lightning beat the Pittsburgh Penguins 4-2. Tom Kuhnhack and Scott Wilson scored for the Penguins, while Zatkoff gave up 4 goals on only 20 shots faced. The Lightning opened the scoring midway through the 1st period after the Penguins had a great scoring chance that pinged away harmlessly off the post. With a number of bodies in the shooting lane, Anton Stralman fired a shot from the point that just snuck inside the far post and in. Minutes later, Tampa Bay made it 2-0 on Steven Stamkos' 300th NHL goal, again off a shot from the point with traffic in front. An Alex Killorn shot into traffic hit a body and redirected off the near post to a wide open Stamkos on the far side, who easily put the puck into the open net to double the Lightning lead. Things started getting chippy after the second Lightning goal. Kris Letang and JT Brown got sent off for coincidental minors with 5 minutes left in the 1st after Letang retaliated with a slash against Brown after he cross-checked Letang up high in front of the net. Sidney Crosby and Tyler Johnson then got sent off on coincidental roughing minors after getting into a scrum after the final horn. The 2-0 hole was a tough break for a Penguins team that largely controlled play with a score-adjusted 57.9 CF% in the opening period, but it would quickly get worse. 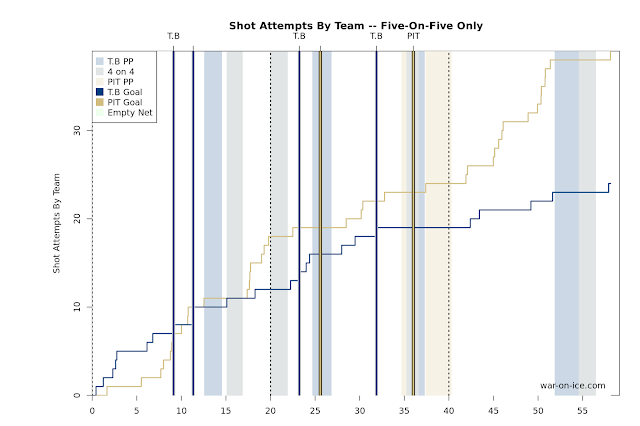 Minutes into the 2nd period, the Lightning increased their lead further on yet another point shot. Matt Carle was credited with the goal, but his point shot appeared to hit Ondrej Palat before trickling through Zatkoff's open 5 hole. Things appeared to be spiraling hopelessly out of control when Trevor Daley and Cedric Paquette picked up coincidental roughing minors, but instead of 4 on 4 hockey Daley was assessed a second roughing minor. However, it was a great individual effort by Tom Kuhnhackl that cut the lead back to 2 on the penalty kill. Kuhnhackl picked up an errant centering pass between the circles, chipped the puck past Victor Hedman, and took it in on a breakaway for his first NHL goal. Kuhnhackly brought it in down the left side of the ice, skated in on Bishop, and roofed it over Bishop on his backhand. However, the Penguins weren't able to take advantage of the momentum, and multiple breakdowns allowed the Lightning to increase their lead back to 3. Jonathan Marchessault gained the zone down the right side and sent the puck cross ice, where it found a streaking Palat. Zatkoff took himself out of position, sliding out of his crease to try cutting off the shot from the left-handed Palat down the left wing, Derrick Pouliot abandoned Tyler Johnson in front, and Palat was able to find Johnson for an easy tap-in that Zatkoff had no chance to make a play on. However, Tampa Bay still wasn't able to fully put the game away, as late in the second Pittsburgh again pulled to within two, and it was the AHL callups again making a play. Bryan Rust got a shot off in traffic that Bishop turned aside, but Scott Wilson followed up on the rebound and fired it past the Lightning goalie for his 2nd NHL goal in as many games. The Pens had a great chance to pull things even closer before the 2nd intermission with 1:08 of 5 on 3 action, but Tampa was able to turn aside the threat and maintain the 2 goal lead into the break. Unfortunately, the lead would prove to be too much to overcome. Chris Kunitz had a great chance midway through the period before Bishop robbed him from in close. Phil Kessel wristed a shot that Bishop turned away right to Kunitz in the middle of ice, but he was able recover just enough to get a toe on the second chance and prevent the Pens from cutting the lead to 1. Unfortunately, a missed call on part of the refs was instrumental in helping Tampa preserve the lead further. A blatant slash by Paquette caused Kris Letang to lose his stick and the play to go the other way but went uncalled. After a tussle between the two, the Letang stole Paquette's stick and continued to play with it. He was called for an illegal stick, but the refs compounded their mistake by giving him a double minor for unsportsmanlike conduct as well. The goaltending overshadowed the fact the Pens had the upper hand of the gameplay against the Lightning with a score-adjusted 57.0 CF% at 5-on-5 play and allowing the Lightning just a 35.9 CA60. However, they weren't able to get any big saves to keep them in the game. Ben Lovejoy left the game early in the 2nd period and did not return, leaving the Pens playing with 5 defensemen for the majority of the game. The Penguins will travel to Buffalo tomorrow to take on the Sabres in another afternoon matchup. It's imperative that Jim Rutherford calls up Matt Murray from Wilkes-Barre if Marc-Andre Fleury is unable to make the start tomorrow.